LuTu Bluetooth FM Transmitter for car with radio aux adapter has the cup-shaped appearance,the designing inspiration come from the car accessories inside,very fitable and beautiful. The car mp3 utilized most advanced interference and noise cancellation technology, to grant most crystal sound quality. Automatic identification of charging equipment modeland charging environment.Then match the best current, the charging process is more stable, the charging rate is more reasonable, and the charging conversion efficiency is so high. 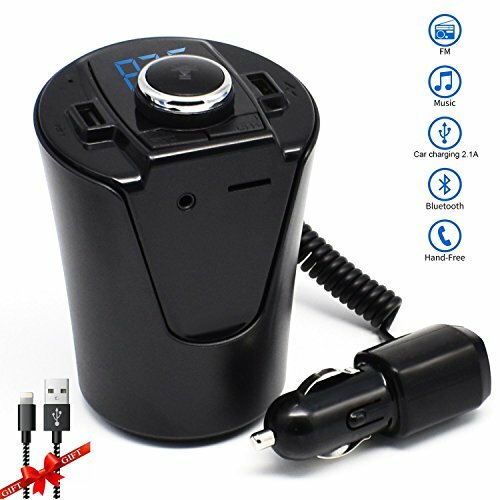 Will be able to launch your cell phone music to your car stereo. Calls can be switched to hands-free status, At the end of the call, Will automatically switch to music playback. No need to adjust the frequency, you can easily enjoy the music. Once Mobile phone Bluetooth connected, turn on the GPS navigation, the car audio can play the GPS navigation which makes your travel safer. WARRANTY:3 years worry-free guarantee which ensures long-lasting enjoyment of your Car FM Transmitter. We supply for you high quality auto transmitter and friendly customer service. If you have any questions about this product by BX6, contact us by completing and submitting the form below. If you are looking for a specif part number, please include it with your message.